Yorkshire Pudding is one of those things that seems to have a bit of a mystique surrounding it. There are cooks who say the batter must be made the night before, refrigerated and used cold; while just as many say it must be made right before baking. Some say you must take care to not overmix; others insist you must whisk as much air as possible into the batter. There's a lot of controversy over proportions, especially the number of eggs. And over whether part of the liquid should be water, and how much. I've seen experts of equal stature calling for starting temperatures anywhere from 375F/190C/Gas5 to 450F/230C/Gas8. I've made puddings at both 425F/220C/Gas7 and 450F/230C/Gas8. Both were fine. The point is that the preheated fat in the tins be blistering hot. I've made them all sorts of ways, and they're always good. I don't think you can mess them up really. One thing few people ever mention is the puddings sticking to the tins, a problem I've had on more than one occasion with my plain aluminum muffin tins. The solution seems to be to grease (I used butter) the cold muffin tins thoroughly before ever getting down to business. Having that extra layer of fat in place before adding the melted fat for preheating seems to take care of the problem pretty well. Any tips? I don't know that anyone else puts dry mustard in their Yorkies, but that's something I learned from my mother. She had a million uses for dry mustard. I put in just enough to make you notice there's "something," but not enough that you know what it is! Do you have any surefire tips for making Yorkshire Pudding? Any methods you (or your mother or grandmother) always insist(ed) upon? PS I'll write all about making a small roast beef another day. In the meantime, here's my Braised Brisket, perfect for Sunday Roast (also called Sunday Lunch). 1 An hour and a half before serving time, make batter. In medium bowl, whisk together flour, dry mustard and salt (to "sift"). Whisk in eggs and water; when smooth, whisk in the milk. Cover and let stand for an hour. Grease a 12-cup standard muffin pan and place it on a rimmed baking sheet. 2 Thirty minutes before serving time, take roast out to rest and turn oven up to 425F/220C/Gas7. Place muffin tin on baking sheet. Spoon 1 teaspoon of hot drippings into each muffin cup. Put baking sheet with muffin pan in oven until sizzling hot, about 5 minutes. Note: You really must place the muffin tin on a rimmed baking sheet to prevent the fat from messing up your oven when it bubbles over during the baking of the puddings. 3 Whisk the remaining tablespoon of the melted butter/oil mixture, or drippings, into the batter. Remove pan from oven. Working quickly, using a partially filled 1/4 cup measure, pour 3 tablespoons batter into hot drippings in each cup. It should sizzle. Return pans (on baking sheet) to oven and bake 30 minutes or until puddings are puffed and golden. If they aren't crisp enough to suit you, then turn the temperature down to 325F/165C/Gas3 and bake for another 10 minutes to get them extra crispy. Serve immediately. Note: When making a large roast, there are plenty of drippings for both gravy and Yorkies. But this day I made a small roast, 2.375 pounds, which did not supply enough fat, so I used the butter and olive oil combination. Very tasty! For both health and flavor reasons, I would never use the frequently recommended vegetable oil or shortening. Ahh, thank you for posting this guide, Jean. One question: do you think it matters if the milk is full-fat / skimmed? We usually have skimmed in the house and I'm wondering if it's a contributor to my less than amazing toad-in-the-hole. Pauline, sorry to take away your excuse for your "less than amazing" :D toad-in-the-hole, but skimmed should be fine. I always use 2% for everything. I don't want to have a refrigerator full of different milks and creams, going off and going to waste; so I do everything with 2% and cream. For these, I cut my 2% with water. For things that might call for a richer milk, I heft up my 2% with cream. But you could experiment and make sure. If you'll email me your recipe, maybe I can spot a problem with it. in the hope that the weather isn't so good and I could stay and work at home ! Dear Dany, thank you. I hope you will try it soon. I especially love it during winter. Sunday roast here I come! Thanks, Honora! I hope you'll make some Yorkies soon! Another enchantment above my pay grade. Never quite sure what is meant when people mention Yorkshire pudding. Thank you for sorting out the recipe. It’s like line editing in writing. So I have no critique to offer other than the fact that boosting the role of grease in anything and adding mustard makes my tastebuds stand up and bark! C’mon sugar! Cheryl, I wish my husband had an interest in cooking! You know, I'm going to have to make a batch just for tea because I never have any leftover to try with jam! Maybe your husband should leave a comment and give us helpful hints on our Yorkies. Well, Sully, you *can* add some sugar by serving them with jam! But glad you can appreciate the grease and mustard! Thanks for posting this recipe, Jean; I can't wait to try it! I have always made my pudding in a 9x13 baking pan and just cut it into individual squares for everyone, but I love the idea of individual Yorkies! Your Yorkshires look just like mine! Recipes are similar but I have never tried the mustard. I must say that roast beef with Yorkshire pudding is a real treat here. I made them a few months ago but when my kids were growing up I made them often because we all enjoyed them. You know, I have often thought they would be good with jam too but there are never any left over in my home. I think I will double the recipe next time and enjoy some with jam for tea time. Yum! Carina, do let me know how you and your family like the individual ones and how you think they compare to your usual 9x13 pudding. I want to try a big one soon. Sandi, I love that little touch of mustard. And I *was* going to say you could leave it out for the puddings you're going to put jam on, but you really don't need to. It's very subtle. You might try the jam before I do, so if you do, let me know what you think: just as good with jam as gravy? I don't think I've ever even seen a recipe for Yorkshire puddings, much less eaten one so I find this post fun in lots of ways! Thanks -- I always learn something new when I visit you! Jeanie, thanks so much! Let me know if you decide to make it! Oh, Martha, I hope you'll try it soon! I'm going to make another roast again very soon. Popovers are the same without starting with a roast and drippings, right? Anyway I've never had any luck with using butter as a greasing agent for muffin tins for anything with flour. It always sticks. I use non-stick cooking spray which seems to allow them to slide out or at least release pretty easily. The next time I make a roast, I'll try this method. Sure looks good and I LOVE crispy. Thanks, Judy. Maybe I'll try the cooking spray next time, though I must say the butter worked beautifully on my last batch. Not much different than popovers, but I never think to make them other than when I make a roast. I would love to try your recipe. My mother-in-law was wonderful at baking Yorkshire pudding, amazing actually. I use her recipe but they are nothing like hers were, not sure what I'm doing wrong. Debbie, thanks, that would be great! We'll get it figured out! Jean, thanks so much for the recipe. I love Yorkshires but rarely have them. I think I will be trying them out. Thanks for sharing. Sylvia D.
Thanks, Sylvia. I hope you *will* try them out. They're one of those things that really wow guests because they don't know how easy they are! David, I think you and my mother would've gotten along very well! Cooking together (*and* stirring up cocktails!). She had a great palate, and everything she made was just that little bit better than anyone else's version. I've heard of Yorkshire pudding but never knew what it was. This looks delicious! When I was I child growing up in London (and I'm now well into my sixties!) mum always madeYorkshire puddings for Sunday dinner. It helped pad out the meal, although true Yorkshire folk ate it with gravy prior to the main meal I believe? We always called individual Yorkies pop overs as the one made in the roasting pan with the meat drippings was a true Yorkshire pudding - we'd argue over who got the crispy corners although I preferred the 'soggy' middle bit. Mum always made extra batter for pop overs and we'd have them with jam and cream as a special treat for Sunday tea! Those were the days!!! Oh Susan, you just painted the most beautiful picture for me! Thank you so much for sharing your Yorkshire Pudding story with me. When my mum made these, there were never any leftovers, so I've never had them with jam. Next batch, I'll set some aside just for that purpose! I wanted to make these a few years ago for a holiday party we hosted but it seemed way over my limited cooking head! No! Kristin, they really aren't over your "limited cooking head" (LOL), I promise! Haven't made yorkshire pudding in a long time. Will have to make this soon. Thanks for linking up with blogging grandmothers. Yorkshire puddings!! You are trying to ease yourself into the Bronte celebrations Jean, I can tell. The sisters would most definitely have eaten them. Originally created in about the late 1730s so poor families could fill up on cheep ingredients and not be enticed to eat too much meat. I love them!!! Can't think of anything better with a nice dark gravy , roast beef, greens and roast potatoes. I have heard they can be eaten that way however its not right really now Jean, is it? Come on, girl. Sort yerself out!!! wow! You really have a talent and gift for baking! happy to stumble on your space from the Friendship friday linkup! Candace, I hope you will. So delicious. But I often make something frequently for a while, then don't make it again for ages. Megs, thank you so much! You just made my day. I hope you'll find lots to like here at Delightful Repast. My mother always made Yorkshire pudding in a square tin and I'd never seen them cooked in a muffin pan until I met my husband. The separate portions all puffed up are much nicer but alas, I can't offer any tips because mine often turn out like hockey pucks. lol I think you're right though about preheating the pan with some grease beforehand to encourage the puffing. Thanks, Judith. I'm sure you won't come up with hockey pucks if you do what I do! :D I don't think it can happen! But I did have Yorkshire Hockey Pucks once in England. A friend of one of my relatives invited us over for Sunday Lunch and well ... I had to be polite and eat one, but I don't know how I managed without breaking a tooth! They look delicious but I'm afraid mine would not turn out as tasty or as pretty as yours did. Thank you for sharing with #blogginggrandmothers. I have shared on nmy social media. Thanks, Karen! I'm sure you would both like them very much! Do let me know how they turn out for you. I've never made Yorkshire pudding, but I have enjoyed it at some tearooms! P.S. It would be fun to shop for teawares together! I love historic and celebrated English recipes. So glad you shared this! Happy Saturday Jean and THANKS for "finding" me. I discontinued the old blog and started over again and I'm so thankful to hear from you! Your Yorkshire Pudding looks so good. I've never attempted this recipe. I like that you add a touch of dry mustard! The cats are doing well...in fact, I bought a new office chair to sit in but I have yet to have the chance!!!! Kitties love it! Margie, yes, it would! I hope you'll give the Yorkshire pudding a try sometime. Bernideen, thank you! I've been trying to think why I've never had them with jam, and I decided it's because my mother made the world's best gravy, so there was never any thought of putting anything else on them. Thanks so much, Mildred. Glad the cats are doing well. I know what you mean about the office chair - our cat has recently taken to jumping into every chair he is not authorized to use! I'll try not to "lose" you again! I have never had them, haha. But my eldest daughter married a Brit so they've been to England many times. And her mother in law makes them every holiday. I was a vegetarian for over 20 years so I am new to meat based things, but I am eating it now for the protein so many have to try and make these or at least order them one day. (Or better yet go visit England myself, finally, right?) OK. That idea is best. Sign me up! Lynda, thank you! Pins and all social media shares are much appreciated. When you try it, do come back and tell me all about it! Heading over to Awesome Life Friday now. Looks so delicious! I have never made Yorkshire Pudding! Now that I have seen these lovely photos I want to make it. Thank you for the recipe! Angela, thank you! I do hope you'll make it soon and let me know how it turns out for you! I've heard of these, but never tried them. I will have to give your recipe a try some weekend :) They sound delicious! That's great, BRnLC! It's such fun to try something for the first time. Let me know how your family likes it. Oh my, with all of the different dos and don'ts I don't know if I would attempt this or not. I wonder if Baker's Joy baking spray would help keep your pudding from sticking to the pan? Thanks Jean from Grammy Dee, #WednesdayAIM #LinkUp #BlogParty, social media shared. That's what I'm saying, Grammy Dee - so many conflicting dos and don'ts, when all you really need to do is quite simple! I hope you'll give them a try. I'll check out the Baker's Joy, thanks! I have meant to try my hand at Yorkshire pudding for years, ever since I first read about it in one of James Herriot's books. I've successfully made lots of other "tricky" recipes over the years, but still haven't gotten around to this one. Mel, I love the James Herriot books (and television series)! I hope you'll try this recipe soon. You'll be making Yorkies to rival Mrs. Hall's or Helen's in no time! These do look good. I've heard the name, but had no idea what they were. Thanks, S. It's funny how when we grow up with something, we just assume everybody did - I'm finding a lot of people in the US aren't familiar with Yorkshire pudding! And I'm sure I've never had some of the foods you probably think everyone has! This Yorkshire Pudding looks delicious, and a-l-m-o-s-t causes me to get cracking. Another possibility, is the approach taken by the "Ma" we knew. After the roast was taken from the pan and set to rest, the roasting pan was returned the oven and the temperature raised to 425 degrees (or so, very hot in any case). The mixed with a spoon batter consisting of beaten eggs, flour and water, (proportions I have forgotten) and poured into the hot pan. This was baked until it was sufficiently spread over the pan, curled randomly, and the batter cooked to a golden brown. This was remove to a heated platter, cut into squares or oblong pieces and served with the rest of the meal. "Ma" beamed while demurring to raves and compliments from 'round the table. Thanks so much for sharing that story! I like it done that way, too. But my mother loved doing individual things (even cute little meatloaves), and that must be where I got my love of individual servings. Next time I do a large roast, though, I'd like to do a big YP and take some photos of it. Maybe I will give them a try. Let me know if Baker's Joy helped. Thanks Jean from Grammy Dee, #BloggingGrandmothers #LinkUp #BlogParty, social media shared. Thanks, Grammy Dee! I sure will. 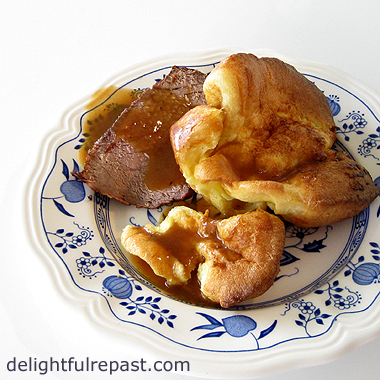 I had yorkshire pudding once at an English restaurant and it was wonderful, especially served with roasted beef. Thanks for all the tips on how to make it. Marilyn, thank you! They would make a great addition to an Idaho winter meal! Dawn, so good to hear from a Yorkshire lass on this subject! I'm only one-quarter Yorkshire lass! Karen, once you start making it, you'll be hooked! It is really the perfect accompaniment to roast beef. Oh sweet Jean, what a delightful recipe and one I would love to try! My precious Grandma Betty from Canada always made Yorkshire pudding at Thanksgiving and Christmas so this brings back a lot of memories....thank you for sharing. I wanted to thank you for letting me know about your giveaway, you are too kind! Forgive me for not entering as I was quite busy last week and not on the computer much. Have a blessed and beautiful Monday! Hugs! I'm sorry you missed that, Stephanie, but I know what you mean. I need to actually schedule a week where I'm not on the computer much! I hope you'll make this soon in honor of your Grandma Betty and let me know how it turns out for you. My English grandmother made the big Yorkshire pudding in the roasting pan, but my mother came to prefer the individual ones (because of the cuteness factor!). Jean, this looks so delicious! I've heard of Yorkshire puddings before, but had no idea what they were. This is definitely something I'd like to try, I'm sure that it would amazed my family too. We all love delicious baked goods and these look like they would go with many entrees. Thanks, Nikki! Definitely try them -- everybody who has ever had them loves them! 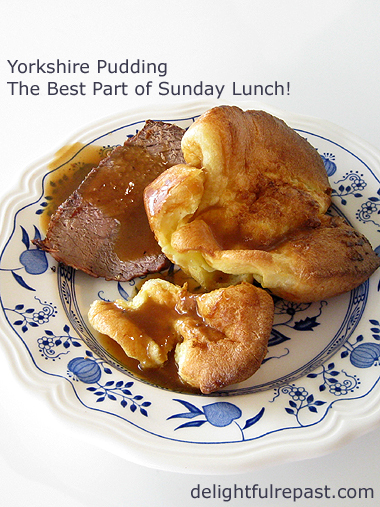 I have never had Yorkshire Pudding, but would love to try! Looks so delicious. Loved learning about them and hope to try them some day!! Thanks for sharing with SYC. Thank you, Jann! I do hope you'll try them soon! I think you'll be hooked. These are really beautiful Yorkshire Pudding and thanks so much for sharing this lovely recipe with Full Plate Thursday. Hope you have a great week and come back to see us real soon! Miz Helen, thank you. Love Full Plate Thursday! Thanks, Peachy's mom! I know Peachy isn't ready for these yet, but when she is, she's gonna love 'em! Thank you for the tip on making them not stick. I made them once and couldn't get them out of the pan. It was ugly! Aw, thanks, Rue! I hope you'll try them again soon. I've made three batches already this month and I'll bet I'll be making at least one or two more! I love Yorshire pudding. I don't know why but I don't make it often. Your look amazing. I agee that there are so many ways to make them. I like the addition of the mustard. I bet it gives it a nice little zip. Oh man. These look fantastic! Bev, thank you so much. You know, when you love to cook, there are sooooo many things to make that you just can't make anything very often! Thank you, Audrey. Love Tasty Tuesdays! "A nice little zip" is exactly the right way to put it! Kapp's Kitchen, thanks so much! You definitely need to give these a go! As much as I cook, I don't think I've ever baked a roast, though I know they can be good! I always use my slow cooker or more frequently over the past few years, my pressure cooker. The meat always ends up tender and literally falls apart with a fork. It sure is nice once in a while to have a piece of meat you can actually cut with a knife! 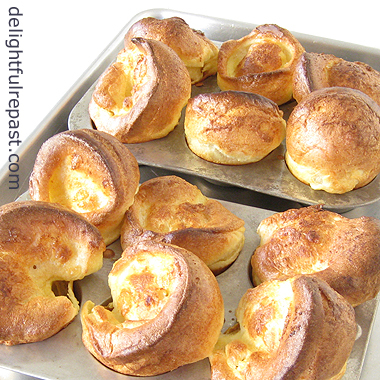 As for the Yorkies, I don't believe I've ever tried them but they sure do sound good! Thank you, Bridget! I do, too.